Heat conduction, or thermal conduction, is the spontaneous transfer of thermal energy through matter, from a region at higher temperature to a region at lower temperature. It thus acts to equalize temperature differences. It is also described as heat energy transferred from one material to another by direct contact. Thermal energy, in the form of continuous random motion of particles of matter, is transferred by the same coulomb forces that act to support the structure of matter. For this reason, its transfer can be said to occur by physical contact between the particles. Besides conduction, heat can also be transferred by radiation and convection, and often more than one of these processes may occur in a given situation. The integral form, in which one considers the amount of energy flowing into or out of a body as a whole. The differential form, in which one considers the local flows or fluxes of energy. Note that the thermal conductivity of a material generally varies with temperature, but the variation can be small over a significant range of temperatures for some common materials. In anisotropic materials, the thermal conductivity typically varies with direction; in this case, is a tensor. is the surface through which the heat is flowing, in square meters (m2). 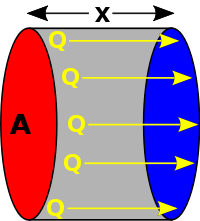 Diagram of linear heat flow, from a hotter surface (red) to a cooler surface (blue). This law forms the basis for derivation of the heat equation. The R-value is the unit for heat resistance, the reciprocal of heat conductance. Ohm's law is the electrical analog of Fourier's law. where the units for are given in W/(m2 K). When heat is being conducted from one fluid to another through a barrier, it is sometimes important to consider the conductance of the thin film of fluid which remains stationary next to the barrier. This thin film of fluid is difficult to quantify, its characteristics depending upon complex conditions of turbulence and viscosity, but when dealing with thin high-conductance barriers it can sometimes be quite significant. The previous conductance equations written in terms of extensive properties, can be reformulated in terms of intensive properties. Ideally, the formulae for conductance should produce a quantity with dimensions independent of distance, like Ohm's Law for electrical resistance: , and conductance: . From the electrical formula: , where ρ is resistivity, x = length, A cross sectional area, we have , where G is conductance, k is conductivity, x = length, A cross sectional area. The sum of conductances in series is still correct. All links retrieved December 12, 2017. Newton's Law of Cooling Wolfram Demonstrations Project. This page was last modified on 12 December 2017, at 17:31.